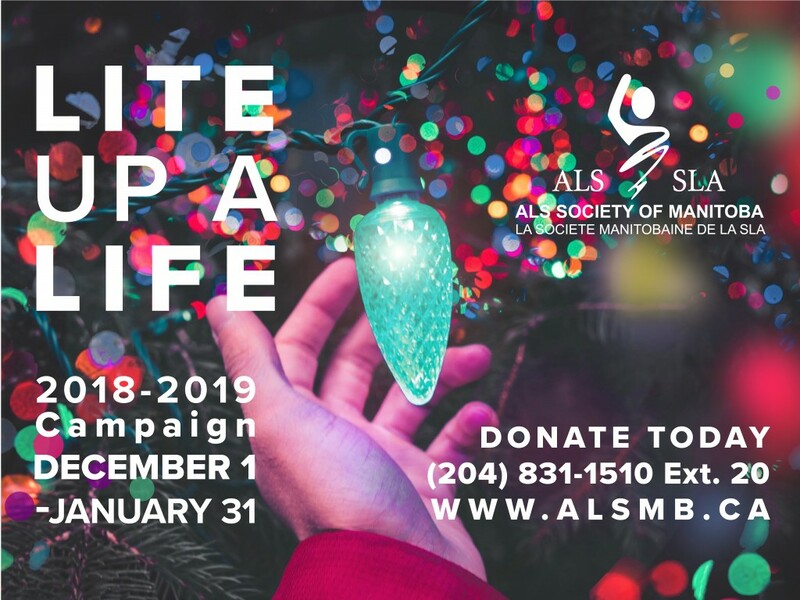 The ALS Society of Manitoba announces the 2018-2019 LITE UP A LIFE CAMPAIGN, starting December 1, 2018 until January 31, 2019. This campaign raises funds to support the Brummitt-Feasby ALS House, the only home with care and support for people living with ALS/MND in North America. Help light the bulbs of the 12 Holiday trees in the front yard: $35 for 15 bulbs, $50 for 25 bulbs, $100 for 75 bulbs, $150 to light a whole tree. OFFICIAL LIGHTING CEREMONY will be held on Wednesday, December 12, 2018, 7 p.m. at the Brummitt-Feasby ALS House located on 106 Kirby Drive (RSVP by Friday, December 7, 2018). To RSVP or for information and donations call (204) 831-1510 Ext. 20 or go online at www.alsmb.ca.